In April 1994–over a span of just 100 days–upwards of 500,000 Rwandan Tutsis were massacred in a spasm of ethnic violence, with ethnic Hutu neighbors killing Tutsi neighbors who had no protection from the Hutu-led Rwanda government. The US Government was nearly paralyzed as the genocide came just 2 years after Somalia’s bloody “Black Hawk Down” episode, and there was a general aversion to involving US troops in that region. President Bill Clinton did not meet with senior leaders of relief agencies to initiate some short term, post-genocide assistance to over 2 million displaced refugees in Zaire (now Congo) and Tanzania–in addition to millions internally displaced inside Rwanda–until August 1994. 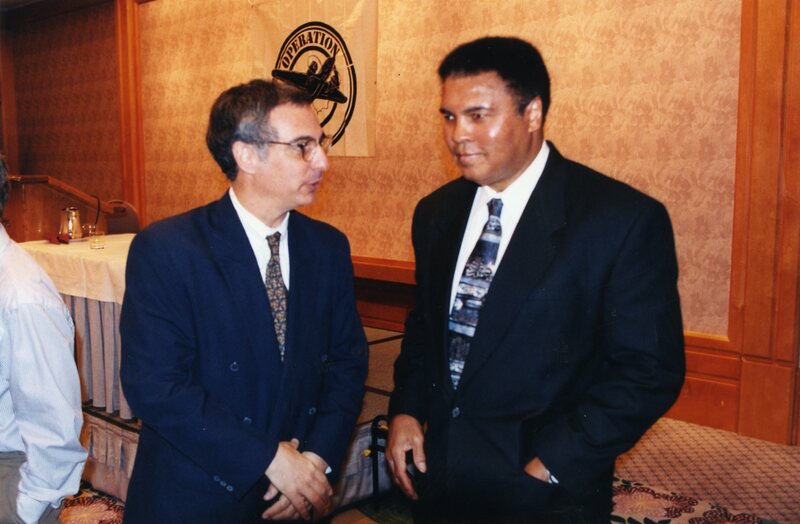 Operation USA played a key role in setting up that August 1994 meeting with President Clinton, thanks in large part to Muhammad Ali, who came to our Los Angeles offices and offered his help. We cannot overstate how effective Muhammad Ali was during that critical period. During a press conference addressing Operation USA’s desire to aid Rwanda, The Champ called for an end to violence. His message: “I fought George Foreman in ‘The Rumble in the Jungle’ in Zaire (Congo) in 1976 and here, less than 20 years later, people are murdering each other for no good reason. I Call On You To Stop the Violence; Keep the Peace!” That message went out in Kinyarwanda, English and French by radio, as it was the medium by which those initiating the genocide spread their call to arms throughout Rwanda. Ali did many similar things over a hugely productive, consequential lifetime. His Rwanda effort with Operation USA enabled us to provide assistance to the survivors of that genocide. Without his help, the relief effort would have begun even later than it did. His presence influenced the US Government to act in its own name, using the logistics capability which only the US military can provide. This week, we mourn the loss of a wonderful man, a committed humanitarian and a friend to Operation USA. Rest in peace Muhammad Ali.